New Years Eve will mark the end of a successful 10-year run for Timo, née Thyme. I've had some memorable times at the two T's including the first "Restaurants are for everybody", and an incredible meal we had with the Mike G family, Timo Supremo. I spoke to John B on the phone Wednesday and in answer to the obvious question, what are you planning on next, his not so obvious answer was to "hit every restaurant on the GNR list." John B is a avid LTH Lurker. Best of luck to Chef Bubala and if any help is needed getting rid of Timo's lardo supply I'm your man. So sad! We just had a lovely dinner done by Chef Bubala at Kendall College. I was sorry we had to leave early (massive jet lag). Hopefully, Chef Bubala will return to the dining scene in Chicago soon. I was so impressed by his generous nature when he assisted in feeding Katrina refugees by opening up his kitchen to LTH volunteers here in Chicago a couple of years ago. Cheers, Chef. Your restaurant will be missed. Hopefully, we'll hear of a new venture on your part soon. I had a very early date with my now wife at Thyme... even hit the little night club that was attached in that day. Must have been 99. Great meal that night, and I had some perfect manhattans. It'll always be a fond memory for me. G Wiv happened to mention to me last night that Timo was closing and I instantly said "Let's go." Frankly, the main motivation was to avoid being forced to eat something like the chicken wings at Great Seas, but I also thought it would be good to pay tribute to them on their way out and wish John Bubala well. The possibility of lardo or guanciale also figured in my calculations. And I was not disappointed on that count, though others might be, because Bubala said that their stores of these things are down to their last bits. But we had tiny bits of fried guanciale cracklin's in a cauliflower soup with a dash of truffle oil-- and it was fantastic, the sturdiness of cauliflower and the salty smokiness of guanciale combining beautifully. A little square of salmon with basil risotto was nearly as good; I see from my Timo Supremo post that we had roast chicken over some flavor of risotto a year ago, but I don't remember it being basil, and it proved to be the perfect herb for keeping the gooey starchiness of risotto bright and lively. Roast chicken turned up in a savory dish with housemade penne, and slices of steak were served with brightly fresh green beans; dinner ended with a crepe filled with chunks of poached pear. All simple yet well-thought-out and satisfying. Along the way Bubala shared with us a number of exceptional wines, each of which came with a story about the friend in the wine biz, or the restaurant biz, or somewhere in Italy who had shared it with him. 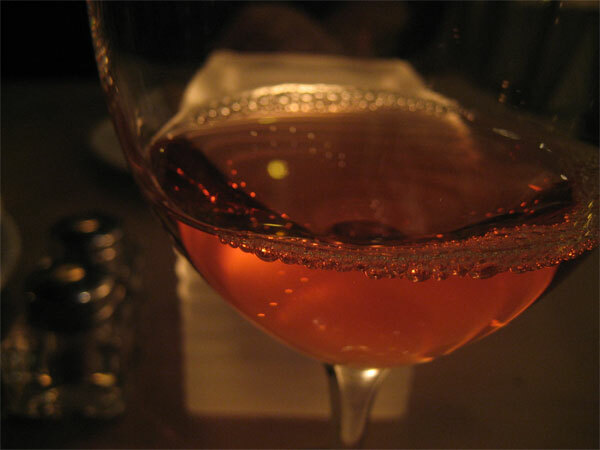 A Stella Bella pink moscato from Australia was a charming aperitif (enjoyed well into the meal), either a Alois Lageder pinot bianco from Alto Adige or a Castelcosa Traminer-- I forget-- was a stinky cheese wine that opened up dramatically with the cauliflower soup. And there was a wonderful half-bottle of Cabernet that was leathery, or even vinyl-y (in a good sense!) with the steak. We ended with a syrupy PX (perhaps the same one Gypsy Boy brought to my Spanish party) and a coffee-steeped Tequila (which, frankly, both of us found too harsh to drink much of). Though Bubala had to pop in and out throughout the meal we had a good chance to talk with him about the restaurant biz, how real estate is driving things in an area like Noble Square or whatever you call where Timo is, lardo brining tips and many other things-- including LTHForum. In a city where one extreme of haute cuisine is making food ever more complex and ingenious, Bubala is one of our best chefs at the old approach of simply combining a few flavors and classic techniques for maximum effect. And his commitment to the Fergus Henderson school of "nose to tail eating," though it didn't pay off with commercial success with Baccala, and to the classic folkways of Italian makes him one of the chefs most solidly grounded in traditional techniques. Which to my mind, makes him a real treasure on a scene often dazzled by glitz and ill-conceived fusions; who needs fiddlehead-fern-miso-tea-infused-gelee-sorbet when a little chunk of cured pork packs so much flavor and satisfies so primally? Whatever he does next, I wish him luck and look forward to trying it. Mike G wrote: But we had tiny bits of fried guanciale cracklin's in a cauliflower soup with a dash of truffle oil-- and it was fantastic, the sturdiness of cauliflower and the salty smokiness of guanciale combining beautifully. Roasted cauliflower soup with guanciale and truffle oil was the perfect start, intense, layered with flavor, yet remaining subtle, a defensive lineman with a streak of shyness. Which brings me to one of the things I admire about Chef Bubala, he doesn't rely on buzz-food shortcuts, truffle oil makes a brief appearance in roasted cauliflower soup then sits out the rest of the meal. I particularly enjoyed risotto with salmon, though I'm a known pea addict. Mike and I had a terrific meal, John Bubula is a consummate restaurateur and friend, I'm looking forward to the next stage of his career. Though, in addition to being fork in hand for whatever he does next, I plan on one last visit to Timo before it is truly fino. Timo's probably my favorite restaurant in Chicago. While we used to go out to restaurants quite a bit, and we like trying new places, we haven't gotten out much in the last 3-4 years because of our young kids. So, when we do get out, we want it to be a great experience. Ever since we first went to Timo a few years back (I'd always meant to get there, but for one reason had not), I've found myself when presented with subsequent opportunities to go out asking myself, "I'd love to try [restaurant x], but why should I not go to Timo instead?" I can't say that I've said that about any restaurant, ever. Chef Bubala -- I can't wait to have these same warm feelings about your next endeavor(s). Mike G wrote: ...makes him a real treasure on a scene often dazzled by glitz and ill-conceived fusions; who needs fiddlehead-fern-miso-tea-infused-gelee-sorbet when a little chunk of cured pork packs so much flavor and satisfies so primally? Is this sorbet something you've actually had? Where? If I may conjecture, MikeG was using the fictional sorbet as an example of overworked pretension that pales before the grandeur of simple pork. Exactly. Timo is very much of the, why use 8 trendy ingredients when 3 timeless ones will do school. Which begs the question, what is overworked pretension? Certainly some of the creations at Schwa or Alinea or Moto could be accused of that, and more. My experience is that their creations have worked for me, for the most part (though let the record show I've not been to Moto yet). Would we rather have a few stinkers here and there (Alinea's Milkweed Pod comes to mind - ugh!) or dismiss new creativity altogether because simple is best? This is a rhetorical question, of course, and I'm not suggesting MikeG really feels this way. George wrote: Would we rather have a few stinkers here and there (Alinea's Milkweed Pod comes to mind - ugh!) or dismiss new creativity altogether because simple is best? Why limit yourself to one or the other? I eat at least three times a day. See, I don't think chefs of the Achatz school do generally overdo it in that way. I think they actually tend to use their space-age techniques for striking but fairly simple combinations with surprising textures or sensations. I haven't been to Alinea but my memory of Trio is of fairly simple novel things-- oysters and lime together, the scent of rosemary produced by hot water being poured over it, the effect of hot and cold and sweet and salty together in a lassi. Likewise Moto and Avenues and Schwa-- direct and simple effects with top-quality ingredients and imaginative handling. The eight-flavors thing is, to my mind, the province of the chef less certain of what he or she's doing mixing too many flavors in the hope that one will impress, or even worse, the chain which thinks, like Elvis' decorator, that the more things you add the classier it gets, and so if pesto is good, vodka blue cheese mole pesto sauce over coconut-crusted Cajun shrimp must be that much better. George wrote: what is overworked pretension? Chicken breast, stuffed with crab meat, topped with gruyere cheese and pesto, served over a bed of rotini spinach pasta sauteed with sundried tomatoes, red pepper and pignoli. You know you've seen that on a menu, don't lie to me. But I did see recently in the Alinea thread a course of two different preparations of lamb with nine different sauces. And that's no lie. Well it was this past Sat, and turned out to be a pleasant but slightly surreal dinner. As we walked in, we were pleasantly greeted and informed the power was out in half the restaurant, but the kitchen was OK.
OK so no problem. BUT no sooner had we sat down that the entire place goes dark, and the power is completely lost. It was very humorous and romantic. They ultimately decided to try and cook slowly for the tables (about 4) that were seated, so we went ahead and held our candles over the menu and ordered, I had the parmesan shrimp, hubs the butternut squash ravioli, followed by the pork and polenta for me and a special of baby rack of lamb over asparagus risotto for hubs. Everything was way delicious, and they surprised us at the end with glasses of prosecco and a warm chocolate cake with mocha ice cream on the house for the challenges of the candlelit dinner. Our parking ended up comped as well. The really funny part was as we were leaving and chatting with Chef B, he said something like, I guess I was supposed to sing to get the lights back on and broke into a rousing chorus of Hava Nagila, but THEN the AMAZING thing is as soon as he finished, THE LIGHTS CAME ON !!!!! Last edited by irisarbor on December 17th, 2007, 9:25 am, edited 1 time in total. Great story, Irisarbor. My last meal at Timo was memorable too... but not that memorable. Let's hope the next incarnation on that great site is another restaurant and not townhomes.